Hi again! Let's have a food post. Ok, it's a real stretch to call this a "recipe". This dish is what it says it is: radishes. Just radishes. The recipe book basically says: "Have you considered eating radishes as a side dish? They're great. Chop them in half and eat them." And, do you know what? I hadn't considered eating radishes as a side dish. 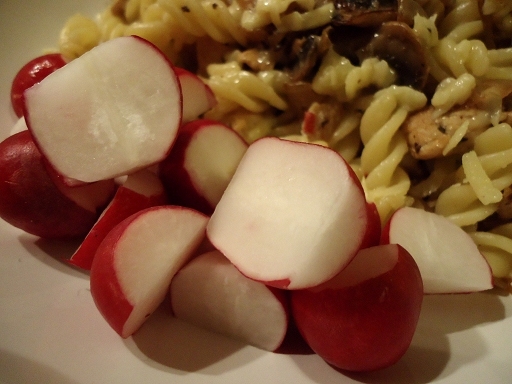 In fact, I rarely ate radishes; they'd never really made it into my food repertoire (probably because I tried them as a kid and disliked the pepperiness). It turns out that radishes really do make a great side dish. They're fresh and crunchy, and I'm always fond of side dishes that don't require any cooking whatsover (after all, some evenings I just want to bung stuff on a plate then shove it in my mouth in 5 minutes flat). I am now a convert and have been eating radishes almost every other week since. Look, I'm not even going to attempt to blame this one on the recipe. This disaster was all on me. STOP LAUGHING. As I say, this recipe had all the makings of a really tasty dish before I got my hands on it. You marinate the chicken in this really thick sauce, which includes coconut milk, coriander, lemongrass, garlic and turmeric among other things. (By the bye, it's been long enough since I last cooked with fresh turmeric that I had entirely forgotten how catastrophic it is. Things that became stained yellow included my food processor, my fridge, my kitchen work surface, my chopping board, my hands, MY TOOTHBRUSH, and a long line of tea towels. I'm not sure I'll ever own a tea towel that's not yellow ever again, even though I'm using industrial amounts of stain remover in my washing machine.) The marinade also asked for candlenuts, which I couldn't find, so I substituted with cashew nuts. When it was all mixed together, the marinade smelled great. Alas, I wasn't thinking. 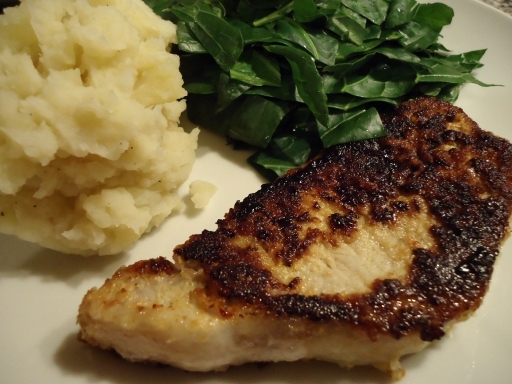 The recipe calls for the chicken to be cooked for 30 minutes at 250°C. I know from experience that my chicken legs only come out fully cooked if I give them 50 minutes. The problem is, that's normally 50 minutes at 200°C (and even then the topping comes out burnt more often than not). 50 minutes at 250°C was basically incineration o'clock. 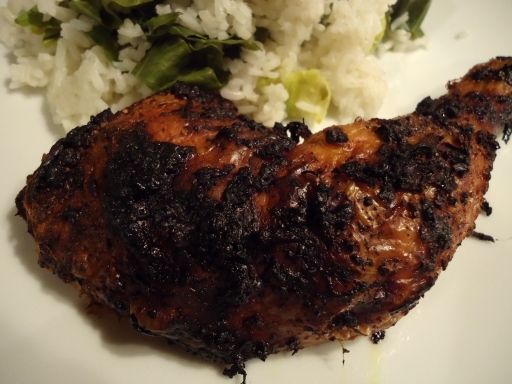 I mean, my chicken was still nicely cooked inside, but most of the taste from the marinade was gone; it was just carbon (well, carbon and yellow staining everywhere). Here we have one of the ugliest photos in this post to accompany one of the best recipes. This is the dish that the Groundnut Cookbook takes its name from. The cookbook was born from a supper club, which was called The Groundnut Supper Club. The blurb alongside the recipe tells us that this is a recipe from Duval Timothy's family and is basically the reason why the three of them started the supper club together. I CAN TELL WHY. This is a gorgeous dish and perfect for this time of year: warm, rich and comforting. That's not to say that it's easy to cook! The hardest part is, without a doubt, the chicken. You see, the ingredients list blithely calls for "1 chicken, skinned and chopped into 8 pieces". That sounds so easy! Unfortunately, if you have zero experience in butchery, plus a knife that's not really sharp enough, you are going to struggle. Honestly, there was one part, where I was busy trying to saw off a leg, that I felt like a living incarnation of Judith beheading Holofernes. It was carnage. And to have to skin it as well as butcher it; my God! I'm sure an experienced cook could do it in five minutes. It took me an hour. Then the recipe says that you have to sear the chicken before making the stew. Doing that in batches (because I have a small pan) took almost another hour. By this point I was worried that my chicken had been sitting at room temperature, half-cooked for a long time. I made sure to cook the final stew for longer than the 25 minutes the recipe says, because I wanted to make sure the chicken was fully cooked. (In some cases 25 minutes may be fine, but when I checked my stew at the 25 minute mark, parts of the chicken were still merrily oozing pink juices.) There are two more issues with this recipe, one of which is an error on my part, and one of which is an error on the recipe's part. My error was to take the scotch bonnet pepper out too soon. The recipe says to pierce the pepper and let it cook with the stew, with the caveat that you can take it out whenever the stew is getting too hot. I had never cooked with scotch bonnet peppers before, and I was worried they were going to be way too spicy for me. Fairly early on in the cooking, the pepper got so soft that it split open; I panicked at this and removed the pepper before the seeds could go everywhere. This left me with a stew that didn't have any heat at all. Note to self: leave the chilli in next time. The recipe's error is a typo: the ingredients list says to use groundnut oil, while the recipe instructions say to use olive oil. It was only once I'd used olive oil in the dish that I realised the ingredients list said something different. The dish still tasted great with olive oil, but the smoke point is too low if you're searing cuts of meat; I think groundnut oil would have been better. Ok, all that aside, this dish was almost worth the effort. It tasted so rich! Sweet onions and creamy peanut butter in this thick sauce with moist chicken (and I say this as someone who doesn't care much for peanut butter in normal circumstances). 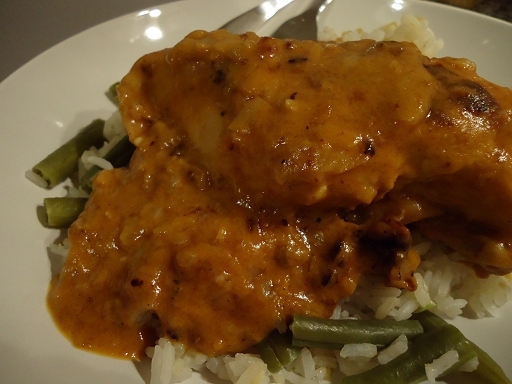 The groundnut stew is comfort food at it's finest. So so tasty. The only reason why the dish isn't fully worth the effort is because it would be so much easier to just buy a pack of chicken drumsticks and use them instead of all that butchery. But if you go down the drumstick route then it would be well worth the effort. Your tastebuds will thank you. I wasn't sure what to expect from this dessert. 1) I'd never eaten fresh figs before, and I'd always found dried ones kind of lacklustre. 2) How exciting can baked fruit really be? But I was wrong. I WAS SO WRONG. This dish was easy to make and amazing to eat. My figs were small, so I used more than the recipe says and baked them for less time. I might still have baked them for too long, because you can see how one has just collapsed at the back there. Still, who cares if it doesn't look that pretty when it tastes so good? I felt like I was eating a fancy restaurant desert. 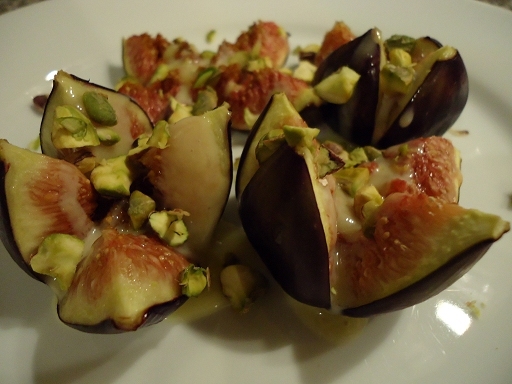 The mixture of the olive oil, cream and honey on the figs made it so rich and creamy, and the pistachios were the icing on the cake. I am astounded that a dish that's 90% fruit can be this indulgent. It was gorgeous.